The best way to see this wonderful town is to rent bike Lucca! You can discover the real town and you can roam to see every little hidden alley. Don't forget to look high up to observe wonderful windows and terraces! If you decide to rent bike Lucca you must go upon the ancient walls. You can follow the entire itinerary of 4,2 kilometres and see all the ancient town and its secret gardens that you would never see otherwise. It's easy to walk trough the walls, but if you rent bike Lucca it will be much more amazing. 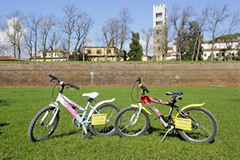 You can rent bike Lucca also to discover town's surroundings, like the magnificent villas (Villa Torriggiani, Villa Reale, Villa Oliva, Villa Bernardini) or the romantic area of Moriano. And if you want to follow the wine's way just rent bike Lucca! Tuscany and Lucca surroundings are unique places and if you want to know the real and not only the touristic region, the best way to do that is to roam and talking with people (they are very friendly) and the best choice you can do is to rent bike Lucca. And if you are a real sportsman, you can discover Garfagnana and its rural treasures, but remember: Garfagnana is not level, so if you decide, you need to be very fit. You can also rent bike Lucca to reach the sea toward Camaiore way. It's a very beautiful itinerary to reach Versilia and diving in the tuscan sea. Versilia is a wonderful destination, with Viareggio and the Opera Festival, Forte dei Marmi and Pietrasanta. And everything is very close to Lucca! Lucca is very next to the main destinations in Tuscany, as Firenze and Livorno, and you can rent bike Lucca to go to Pisa. You can choose between 2 itinerary and they are both amazing and panoramic. 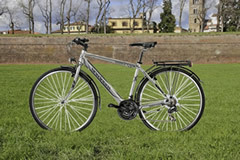 Whatever you want to see, the best choice you can do is to rent bike Lucca!